Little Tikes knows it’s important for kids to stay active! 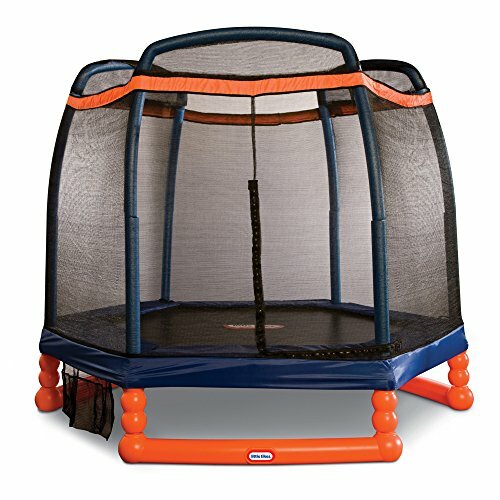 This bouncy, kids trampoline is both durable and padded with an included safety enclosure net. It’s the perfect size for providing hours of safe, bouncing fun! A great first trampoline for your toddlers and older kids! Key Features: • Durable, high-quality pad protector covers the safety springs to prevent injury • Frame is made of durable blow-molded plastic and high-quality steel • Safety enclosure is made of PE netting and supported by heavy-duty steel poles • Ideal for outdoor active play! • Easy to assemble • Jumping Area: 7.69 ft. in diameter • Weight Limit: 105 lbs • Maximum number of children: 1 • Outdoor Use Only!